A few weeks ago we announced many of the contributors to the third volume of Waywords and Meansigns, our international project setting Joyce’s Finnegans Wake to music. This project has been ongoing for a few years. We began by producing two unabridged musical editions of Finnegans Wake, with each chapter being performed by a different musician or musical group. It is quite fun to hear our contributors from previous years returning to the same book, but with new approaches and depth. Railroad Earth fiddler Tim Carbone returns as part of a duo called Cedar Sparks, working with Lewis & Clarke’s Lou Rogai to evoke a pastoral scene reminiscent of the foggy Irish countryside, complete with the loveliest fiddle you’ll ever hear. The Conspirators of Pleasure combine “a very reasoned voice” – the reading of Annette Perry – with “a very unreasonable soundtrack”. Trumpeter Gareth Flowers builds gentle and flowing dreamscapes while Neil Campbell showcases his “advanced mumbling techniques” with four multi-tracked voices. Hayden Chisholm, having released a new album last year called Finn Again Wakes, reveals the hours upon hours he’s dedicated to reading the Wake aloud. Having utilized an entire demented orchestra for his previous contribution, composer Steve Gregoropoulos returns as a one-man band, playing everything from mandolin and guitar to clarinet, violin and drums. Returning contributors also include Joyce scholar and musician Hinson Calabrese, DJ and writer Steve Fly, artist Kio Griffith, musician and visual artist Belorusia, Shakespearean actor William Sutton, Simon Ross of cel and SIKS, and many more. It’s going to be wonderful, weird, and fun. We can’t wait to share all these new sounds with you. To learn more about Waywords & Meansigns, visit www.waywordsandmeansigns.com. Join the mailing list to keep informed about the project, or just stay tuned to the Joyce Centre’s blog for more updates! 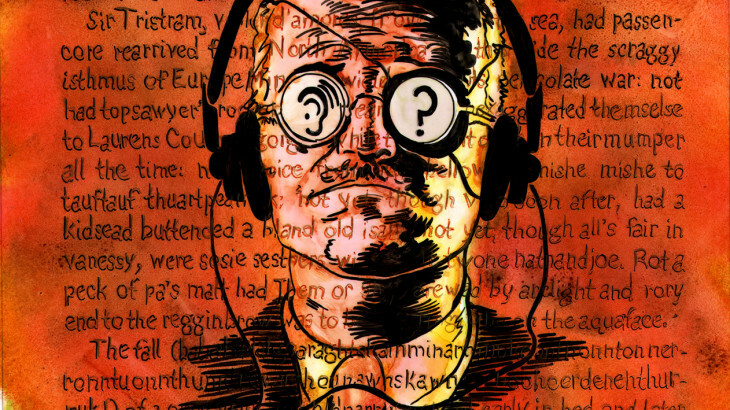 Finnegans Wake, News, Uncategorized. permalink.